The first order of business after purchasing this home is simple: buy a thesaurus. It’s the kindest thing you can do for yourself, your family, your guests and anyone who sets foot in this 7,093-square-foot home. Words will be hard to come by, especially when one’s jaw is permanently dropped. Nowhere in this home is speechlessness more rampant than where the kitchen, great room and dining room converge. Here, to the left and right of a 72” long fireplace that anchors the great room, are ceiling-high pocket doors that slide out of sight, revealing views of the valley and Carson Range beyond the north deck and a back deck that nestles into the hillside to the south with views of Lookout Mountain. From all points of this area — kitchen, great room and dining room — the scene can shift from warm, intimate and enclosed one moment to “one with nature” the next as the line between indoor and out is tucked away. Even the corners of these walls of window disappear. It’s an entertainer’s dream, regardless of the size of the party. The kitchen is graced by a wine cellar whose 409-bottles are on full display and glass flooring that overlooks the game room below. Tying this three-level home together is a glass elevator with stunning views and a series of graceful, floating staircases that lead to 5.5 bathrooms and 6 bedrooms, including a master suite with pocket doors, fireplace, deck and a stunning no-touch steam shower with floating benches. 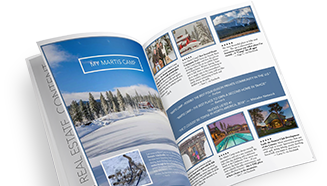 The top level features two bedrooms, and a deck and hot tub with views of Martis Valley and Mt. Rose. Virtually this whole Martis Camp home is pre-wired for audio/video and most of it is already active. Walnut floors run the course of the home while doors, trim and cabinets are white oak. Countertops are granite and the decks feature floating porcelain tiles that secret water away from the surface, along with two fireplaces where guests and family can gather. Location is the final trump card this home holds: for one, it’s nicely elevated above the end of a cul-de-sac; secondly, it’s situated in sight of Lookout Mountain above, in the event that, — for some reason — you’re compelled to step away from this home’s endless attractions and head to the slopes.